I have an affinity towards doughnuts, not the regular stuff sold on the kiosks, but some traditional street food doughnuts that are popular in a particular country. 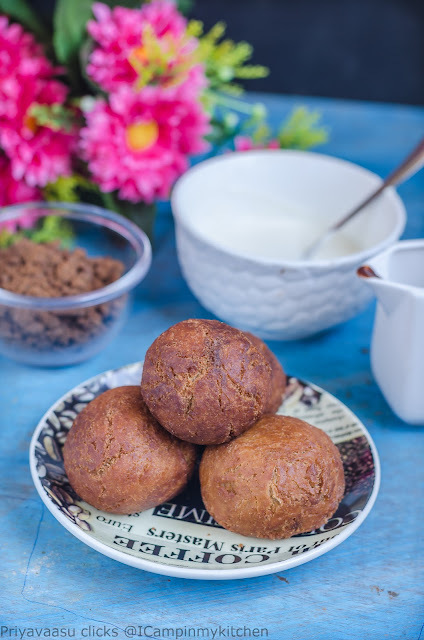 I have made Yemeni Bakhmri, Berliner, Croatian Krafne, Dutch oliebolen, Bamieh-persian doughnuts,Kenyan Mandazi, Somalian Puff Puff, our own Urad dal Vada. So, while planning the birthday treat theme menu,i was looking for an easy to make doughnuts, that is when i remembered the bookmark folder. I saw a video in Proper Tasty, FB page and saved this Cookies and cream doughnuts recipe. The only change i made is to add Buckwheat flour to the recipe. It is ok if you don't have buckwheat flour, you can either substitute it with Whole wheat flour or use All purpose flour. A deep fried dough ball, stuffed with chocolate cream cookies crumble and chocolate. 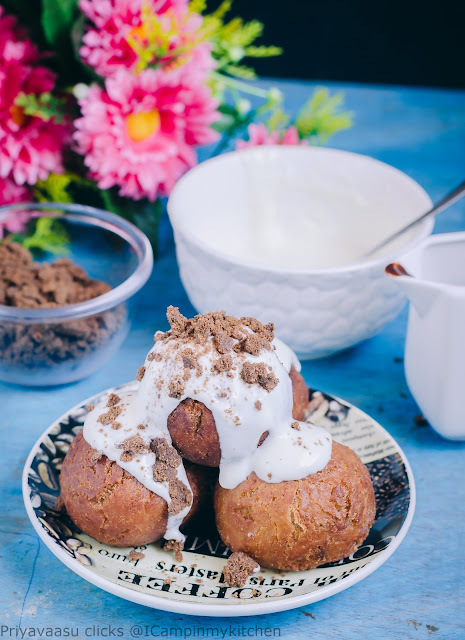 It is served heavenly with a generous drizzle of sweetened cream cheese , melted chocolate and cookie crumb. The taste was yum, my elder one loved it. My lil one had it straight from the stove, so he didn't like them much, but when i was photographing it the next day, the aroma of vanilla, wafting in that room, pulled his little nose and pestered him to eat. So, they taste delicious the next day, when the flavors are well settled. These can be made a day or two ahead and refrigerated. It should also do well in the freezer. While serving from the fridge, just reheat it for a minute and serve with the toppings. In a zipoloc pouch, take the biscuits and pound it well using a rolling pin. I took help from my lil one, thoroughly enjoyed pounding the biscuits. Remove it to a bowl, save 2-3 tbsp for garnish. To the remaining crumble, add cream cheese and mix well. Keep aside until use. Divide the dough into 12 balls. Flatten each ball in your palm, stuff a teaspoon of cream cheese chocolate cookie filling into it and place a Hershey kiss in the center. Bring the edges together, seal and shape it into a ball. Repeat the same with the rest of the dough. Heat oil for frying in a pan, when it is hot enough, drop one ball at a time in to the hot oil, fry it until golden brown. Remove it using a slotted spoon and drain on a kitchen towel, Repeat the same with the rest of the doughnut hole. 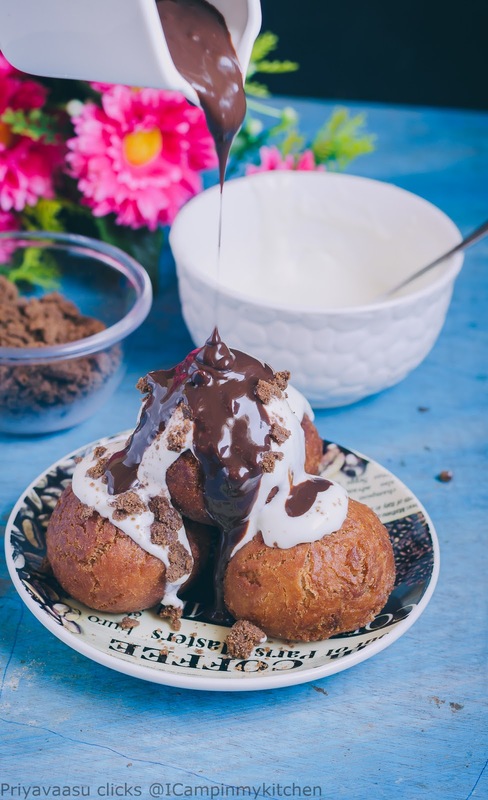 Now comes the fun part of serving, Place the doughnut holes on the serving plate, spoon a generous amount of cream cheese on top, followed by melted chocolate and cookie crumb. Enjoy your mouthful. drooling here. awesome dessert very nice. This looks too sinful and tempting dessert. 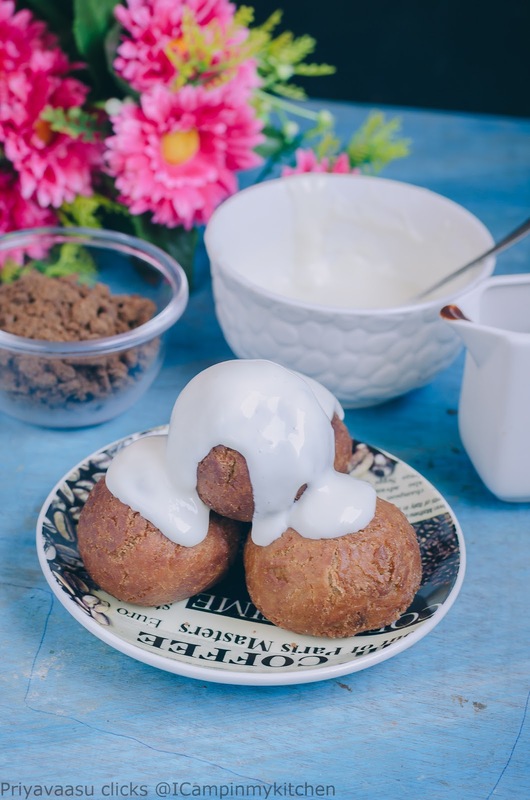 This doughnut holes are seriously sinful, omg, am just drooling here. 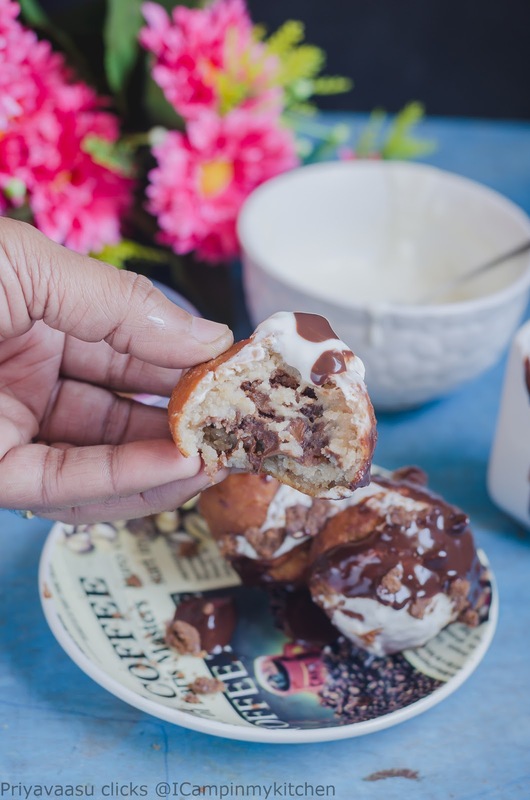 OMG, chocolate chip stuffed donuts then topped with more chocolate -- that looks absolutely delectable. These doughnut treat looks so sinful Priya..what a lovely dish!..I am sure kids will go crazy!